The Soni Ventorum Woodind Quintet Archives are a valuable resource for the woodwind quintet clarinetist, containing streaming mp3 files of live performances of nearly 50 works for woodwind quintet. The recordings represent much of the (now) standard quintet repertoire, such as the Reicha, Taffanel, and Francaix Quintets, as well as lesser-known works like Ruth Crawford Seeger's Suite and William O. Smith's Jazz Set for Violin and Wind Quintet. The video archive is much smaller, but includes this performance of the "Andante" movement from Ibert's Trois pièces brèves. 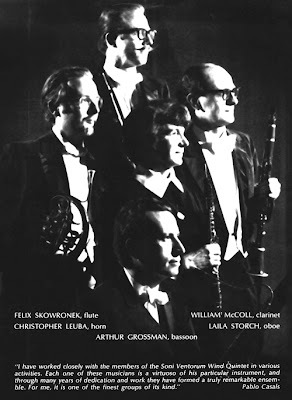 Soni Ventorum was active as a quintet from 1961-2001, and was formed by graduates of the Curtis Institute of Music: Felix Skowronek, flute; Laila Storch, oboe; William McColl, clarinet; Arthur Grossman, bassoon, and David Kappy, horn. Learn more about Soni Ventorum on the History and Artists pages, and explore original newspaper clippings on the Press page. This site is a great example of how the internet can be used to preserve and document the great ensembles of the past through audio and video. Hopefully we will see more sites like it in the future!